When you export the flip book the search feature does not work? Have you ever felt depressed for FlipBook Creator told you can search but you can’t open it? Whatever I should write a FAQ to solve most people’s puzzle. Before this FAQ, you would contact me in email, but after this, I guess you can find a suitable answer by reading this FAQ. Do not forget, if you have problem, you can first visit our support page because there are always comprehensive answers waiting you. As a friendly prompt or FAQ advertisement, whatever, do not look down upon it, most of time, you feel the problem you encountered is a dilemma, and waste of much time on complaint than find its answer on the column of Support FAQs. 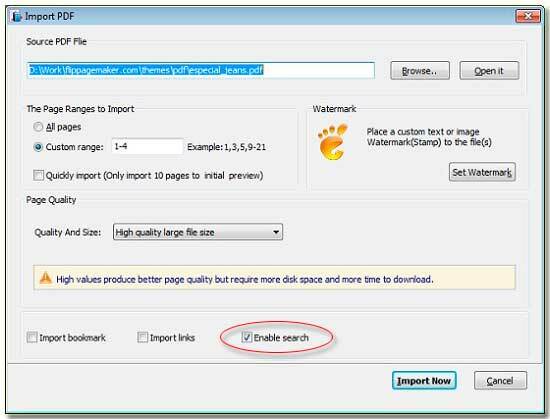 Step2: Click “Import PDF”, and on the bottom of the pop-up window, you should check the checkbox “Enable Search”. Step3: Then import PDF and design its style your favorite. Anyway, if the PDF itself doesn’t contain the content which can be searched, even though you check the “Enable Search”, you can’t search it any more. How to check it searchable or not? You should open the PDF file, and find the icon “Select”, and then click it, encircle an area on the PDF content, if the area is highlighted, it proofs that can be searched.